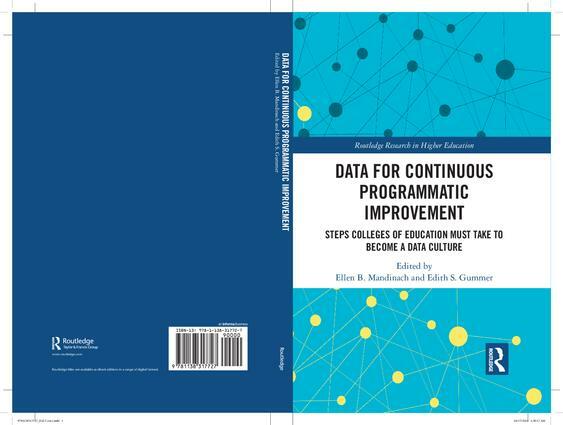 This book addresses the issue of data use in educator preparation programs towards continuous programmatic improvement. With an aim to increase the rigor in both research and practice in educational administration and teacher education, this volume will analyze the longstanding quality concerns about teacher and leadership preparation and standards for programs and educators, as well as controversies concerning national accreditation and federal efforts to mandate program reporting data. By exploring the policies and practices that influence departments of education, this volume examines the increasing pressures to improve institutional functioning, within a complex system of university, state, and national structures and organizations. 1. Introduction and Overview of the Book (Ellen Mandinach and Edith Gummer). 2. Laying the Groundwork for Continuous Improvement (Edith Gummer and Ellen Mandinach. Part II: From the Researchers. 3. Building Capacity and Commitment for Data Use in Teacher Education Programs (Charles Peck [University of Washington] and Susannah Davis [Oregon State University]). 4. Key Effectiveness Indicators in Teacher Preparation (Michael Allen and Charles Coble [Teacher Preparation Analytics]). 5. The Teacher Preparation Data Model (Bryan Richardson [UPD Consulting]). Part III: From the Field. 6. Evidence of Candidate Progress in Educator Preparation Programs (Charis Anderson, Peter Fishman, and Tracey Weinstein [Deans for Impact]). 7. Developing an Educator Preparation Data System: What Arizona State University is Doing (Carole Basile [Arizona State University]). 8. The Evolution of Relay Graduate School of Education into a Data Culture (Kaycee Salamacia and Liam Honigsberg [Relay Graduate School of Educaton]). 9. Data for Continuous Improvement: Steps Colleges of Education Must Take to Become a Data Culture (Scott Ridley [Texas Tech University]). Ellen Mandinach is a Senior Research Scientist and the Director of the Data for Decisions Initiative at WestEd, USA. Dr. Edith Gummer is the executive director for data strategy at the Mary Lou Fulton School of Education at Arizona State University, USA.